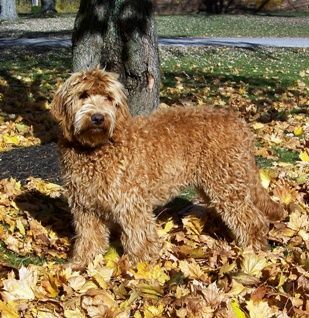 Yogi is a standard Multi-gen Australian Labradoodle with a gorgeous wavy red/apricot fleece coat. DOB 4-23-11. He came from Coulee Labradoodles in Canada. His parents are Prairie’s Top Gun and Coulee’s Sofia Loren. Thanks a million Paige for letting us have this wonderful boy. Yogi is not related to any of our girls and we are so excited that he will bring some beautiful reds to our breeding program. Yogi lives in a guardian home nearby with our retired Matilda. He is a love bug and just loves to cuddle and play with the kids and is definitely therapy quality which is what we look for in all our breeding dogs. Health testing – OFA prelims Hips fair, elbows good, PRA- Clear per parentage. DNA Color Code Bbee (carries all colors).